Using Krita’s color space browser, you can see that there are many different space sizes. How do these affect your image, and why would you use them? Even though you can’t see the colors, the computer program does understand them and can do color maths with it. For exchanging between programs and devices: most CMYK profiles are a little bigger than our default sRGB in places, while in other places, they are smaller. To get the best conversion, having your image in a space that encompasses both your screen profile as your printer profile. For archival purposes. 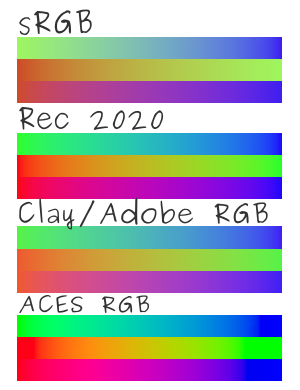 In other words, maybe monitors of the future will have larger amounts of colors they can show (spoiler: they already do), and this allows you to be prepared for that. On the left we have an artifact-ridden color managed jpeg file with an ACES sRGBtrc v2 profile attached (or not, if not, then you can see the exact different between the colors more clearly). This should give an approximation of the actual colors. On the right, we have an sRGB png that was converted in Krita from the base file. Each of the gradients is the gradient from the max of a given channel. As you can see, the mid-tone of the ACES color space is much brighter than the mid-tone of the RGB colorspace, and this is because the primaries are further apart. What this means for us is that when we start mixing or applying filters, Krita can output values higher than visible, but also generate more correct mixes and gradients. In particular, when color correcting, the bigger space can help with giving more precise information. If you have a display profile that uses a LUT, then you can use perceptual to give an indication of how your image will look. Bigger spaces do have the downside they require more precision if you do not want to see banding, so make sure to have at the least 16bit per channel when choosing a bigger space.